Aloha friends! Grab your ticket for a virtual trip to a tropical island. Aloha! Cluster Pays welcomes you to the land of tiki heads with its eye-catching symbols. The mastermind behind this sensational creation packed with amazing features is NetEnt. See you there. How to play Aloha! Cluster Pays Slot? To get you started on Aloha! Cluster Pays, check out all of your betting setups. You can personalise them according to your preferences. Keep reading to discover how to play for the chance to win big! On the 6 reels of Aloha! Cluster Pays you will find a boatload of Hawaiian themed symbols. They include pineapples, coconuts, flowers, tiki heads, and seashells to name a few. Relax on island time with this outstanding video slot machine. Bet Level: The bet level ranges from 1 to 10. Coin Values: You can pick and choose coin values from the following: 0.01, 0.02, 0.05, 0.10, 0.20, 0.50, 1.00 and 2.00. Max Bet: Good News, there’s the Max Bet feature available on Aloha! Cluster Pays Slot. Use this feature anytime you want to bet at the highest bet level as well as at the highest current coin value. AutoPlay: The Autoplay feature allows you to set several spins that will spin on their own. If you want to multitask, that’s the go-to button. 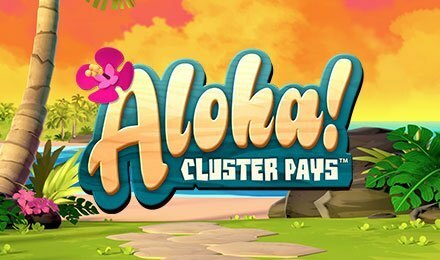 Cluster Pays: How can you get wins on Aloha! Cluster Pays Slot? By creating clusters of symbols when there’s multiple of the same symbol so that it will boost the cluster size. It must consist of 9 or more of the same symbol in a cluster to win. Do you know when a symbol forms part of a cluster? When it is vertically or horizontally next to the same symbol. Now, to help you with your wins, you will find stacked symbols that count as two symbols. Substitution Symbol: During your spinning adventure on Aloha! Cluster Pays, you will find the substitution symbol. They will change into the adjacent symbol to create the highest possible winning combination in a cluster. It can come into view anywhere on the reels and it cannot be substituted for Free Spin symbols. Sticky Win Re-spins: A Cluster win can activate the Sticky Win Re-Spins. With this feature, the winning symbols are held and all the other symbols on the reels will re-spin. If there’s an increase in the winning cluster size, the symbols that increase the size of the cluster will also stick. The remaining non-winning symbols will re-spin again. Free Spin: Yes, you can activate the Free Spins feature here. Try to get 3 or more Free Spin symbols to fully or partially appear anywhere on the reels during the main game. The best part is that some extra Free Spins can be won while the Free Spins Feature is launched. The Free Spins on Aloha! Cluster Pays Slot has a Symbol Drop mechanism. Do you know how it works? The low win symbols are removed, and it increases your chance of landing on some big wins with your remaining spins. Now, if there’s no win on the last Free Spin, you will get a special extra Free Spin until there’s a win. Stacked Symbols: The Stacked symbols will only crop up during the Sticky Win Re-spin as well as with the Substitution Symbol. Play Aloha! Cluster Pays game on the go anywhere and anytime for top wins! You can play this Hawaiian themed slot on your favourite iOS and Android devices. As per the Aloha! Cluster Pays Slot review the rules are the same. Also, at our sister site Aloha Slots we offer all the popular online slots including Aloha! Cluster Pays slots. Create an account on Irish Spins and make a deposit to get your stunning welcome bonus. You can enjoy up to 200% Bonus + 50 Free Spins on Aloha! Cluster Pays on your first deposit. On your second and third deposits, you can get 100% bonus up to £250 and 50% bonus up to £500.